It seems like only yesterday that we arrived in India……..yet it has been almost 3 months and the time is so quickly coming to a close. There have been so many Adventures…Family Weddings…..Hot Days…..Cold Nights…..and Food, Food, Food!!! I want to share My India with you! Just a little brief behind this image. THE Pedicure/Manicure and more than I bargained for. taken……… then Rinse…. and hair brushed. 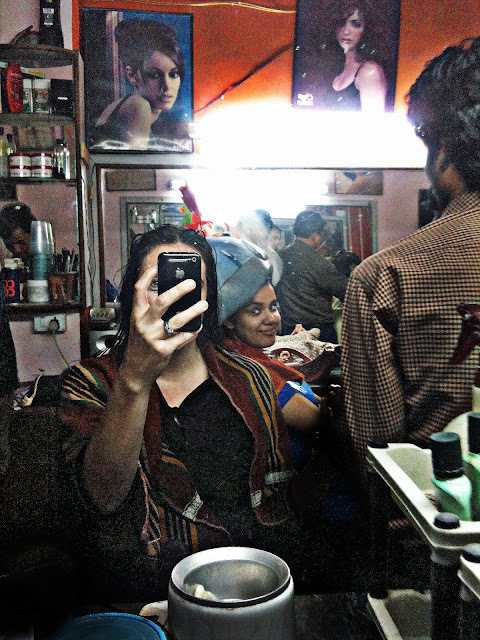 As I am waiting for my hair to be dried in comes the stylist with a dish of something. So I ask Bhupi what the mystery liquid is…….she inquires in Hindi….the answer…..Syrum! Unaware of what it is made of they begin to douse my scalp with it……then the scent…. What is this scent……like onions……Bhupi asks about the ingredients. In the seconds before they answer I realize instantly that it is Onion …………My Eyes tear up …….turning instantly Flaming Red & Bright Green………..I start to laugh and wonder why this would be used? After waiting what seemed like forever to have it washed off & dried the scent became bearable….. Onion…..Veer even said I smelled like an onion…..and so I did…..for the next week and multiple shampoos. Onion…..a commonly used remedy for hair loss which seems to work......I have had far fewer hairs in my brush lately!